Doing #6MonthsWithoutShopping has given me a good reason to go through and wear more of my wardrobe. I have a big box of tanks I don't always wear so it's been fun going through it and wearing some of them again. As well as rediscovering some old ones I thought I no longer had, it's giving me the chance to wear more of my printed pieces. A black tank and a pretty print makes an easy outfit. Wore this to playgroup. For some reason I feel happy wearing dresses and maxi skirts to playgroup but I worried this might be a little overdressed. I'm making an effort to wear this skirt more often though, it's too pretty to be 'saved' for a perfect occasion and it's nice and light for summer. It dried out pretty quickly after getting soaked during water play at playgroup. While I liked the way this looked, the only thing I didn't like about this outfit was how the tank felt to wear. This is one of those really old pieces in my wardrobe. I remember buying this when I was at uni, and for some reason it's been kept all those years. I don't actually think I've worn it at all in the 5 years I've had this blog! I couldn't find it in my archives. It felt different to wear, and I didn't enjoy wearing it. I'm conscious that when I'm breastfeeding some tops will just fit differently, so I haven't gotten rid of this top at the moment...but if I don't enjoy it next time I wear it it won't be hanging around in my wardrobe for long. 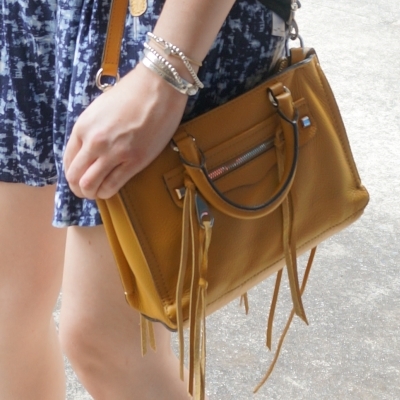 Last worn: Ray-Ban Wayfarer, printed pleated skirt, Rebecca Minkoff gladiator sandals, micro Regan bag. Other ways to wear: mustard yellow printed skirt with peach cami, 30 outfits with Rebecca Minkoff gladiator sandals, micro Regan bag and denim shorts. Unlike the outfit above, I loved the way this looked and felt to wear. I've even worn these blue shorts with yellow again since. I was really happy in this all day. Which was a good thing as our quiet day turned into quite a busy one! Had baby boy's weekly weigh in the morning, and my mum was coming over in the afternoon. After dropping Cooper off at the groomers, a ute nearly drove into the front of our car. I was a little shaken as I'm not a very confident driver normally, but luckily no-one was hurt. I had to get my mum to come pick up Cooper with me though as I wasn't comfortable doing it myself after that! When we got home I was anticipating a quiet afternoon, until Toddler T found a snake. I liked this outfit but when staring down a snake in the back yard trying to see it if was dangerous, I wished I was wearing something a little more suited for snake-wrangling like lots of layers and steel capped boots! Snake catcher confirmed it was just a tree snake and it slithered off happily into the tree. After trying twice to get into the house. 😱 We do a quick scan of the yard now before we let the boys or Cooper out! Last worn: Ray-Ban Wayfarer (above), black metallic tank, printed shorts, two tone sandals, Rebecca Minkoff micro Regan bag (above). Other ways to wear: metallic tank and sparkly skirt, printed shorts in monochrome outfit, two tone sandals and printed dress, Rebecca Minkoff micro Regan bag and a maxi dress. Black tanks with a twist - peplum, lace or metallic. A black tank is a great wardrobe basic that you can easily pair with prints for an instant fuss-free outfit. Linking up with Fashion Frenzy, Fashion Files, On The Edge, Weekend Wear, Flashback Fashion. You should wear the skirt more often, so pretty. I have a similar one that I wore all the time in spring and summer, love the print and colours. I usually wear pink and pink floral prints but this year I am attracted to yellow colours and prints. I love that first skirt, I remember thinking that each time you wear it. I'd happily wear it too, the pattern / colours are lovely. Both of these outfits are so cute! I love the print of the skirt in the first outfit. I think I need some more yellow in my wardrobe! Such a cute skirt! Love it!! Mica. .. I like the cute skirt but I understand that shorts are much more comfortable to wear. I like the shorts too and black tanks ... it's too bad this one wasn't comfortable. Haha yeah I'm not used to snakes being so close! Both these outfits are rocking, Mica, and am so jealous you guys wear tanks over there now:) I have old pieces like your tank too that although looks great does feel weird on coz of how old they are. Why do we keep these stuff, right? And yikes on the snake! Good to know it's not a dangerous breed. Exactly - no idea why I held onto it! OMG, a snake? Steel boots and leather trousers! But probably not the best idea for the Australian heat, I guess. haha yes I might have fainted from heatstroke! I just love the printed skirt Mica, it is so pretty!! Your bag matches your skirt perfectly. Well done momma! It's too bad that tank doesn't really work for you, it has a good strap width and a nice neckline. I wish I could find more of those styles around here! I'd be losing my mind about that snake, especially where you live. I don't know how you guys do it with all of the poisonous critters! The most dangerous thing in my neck of the woods is the cold, lol. Snakes and vehicle near misses aside, I hope you're having a great week! It is a nice tank, but a bit meh for me, I don't like the fit as my body has changed a lot and been through 2 babies since I bought it! Both looks work very well and that first skirt does need more wear its a great piece. You know, I have very few tanks, less than 10 by now, I've gotten rid of them because strapless bras are so uncomfortable. Oh yes I only have ones that cover my bra straps - can't do strapless bras! I really love the print on your skirt! The bag could not be more perfect with it. A plain tank is perfect with a printed bottom. I'm in agreement with that first skirt - so pretty on you! I love the contrast of the bag with the shorts in the second outfit. Toss that old black tank and get a new one! Remember, every item you own, you should love - find a black tank with some special detail, or really nice texture. I love that you're really weeding through your wardrobe with this shopping self-ban. Also, eek! Snakes in the yard? Glad it wasn't anything poisonous. Also, your near miss in the car! You are due for something super-positive, my dear! THanks Sheila! It was a tough day! And I think you're right, I enjoy that other black tank more. I should get rid of the old one! I love that skirt! Such a beautiful item in your wardrobe! I actually have one similar (black and yellow with a geometric design) which you have just inspired me to wear again. I love the flirty skirt! One of my favorite types of skirts. Looks fabulous on you! I love the first outfit, that type of skirt fits you really good! That skirt is gorgeous! I love the colors and the I'm so used to seeing you in long maxi skirts. You look beautiful in it! Yes, nice to have a break from a maxi, haha! It is! Not buying any new clothes has let me explore more of what I own! Dear Mica, I see you really use the content of your closet and I love both of the looks you show here. You inspired me even to wear my tank tops (I own too not too less) in such ways! Interesting you have the top from the first look already that long time! Ehy these are such good looks, definitely something I think you should try out more! And can I point out at the thing with tank tops under $50 - who spends $42 on a tank?? Is it made of mink?? Am I super behind on fashion?? Probably. I really love the print of that skirt! You yellow bag is perfect with both of these looks! Yikes on the snake! Glad it was a harmless one! I really love the mustard skirt and bag. You look great in both looks. This is such a pretty outfit! I love the whole look, and that RM bag is stunning! The mustard colour!!!! Totally loving your 6 months without shopping frenzy! How fun this must be. What month are you on? How cool you find yourself utilizing other aspects of your wardrobe. Keep it up! You are an inspiration to us all! Thanks I started it in January, so completed 3 months now! The snake catcher looked at the pic I took to confirm it wasn't deadly, I had no idea either! 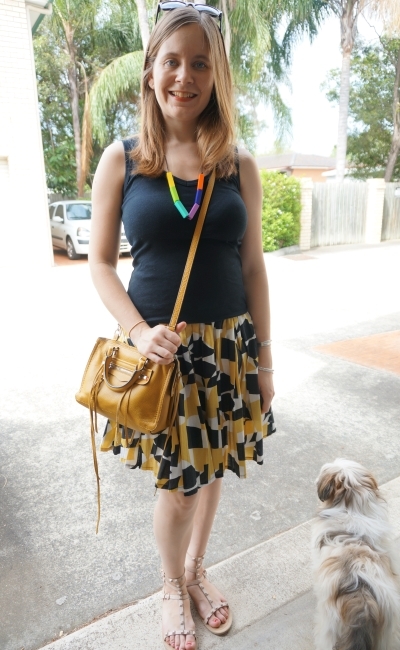 Gorgeous look, love the yellow necklace and cross-body bag. Have a great day! 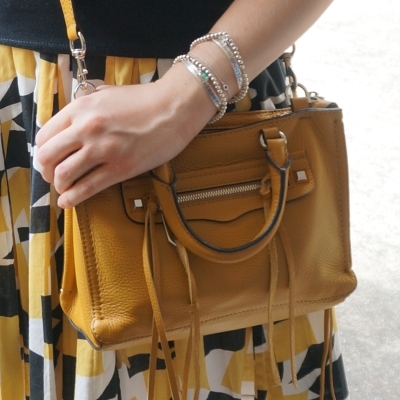 This look is too cute and that yellow bag is the perfect touch! Love that great skirt and fringed bag, the colors are great. what a chic way to do playgroup! Oh my goodness! A snake?! Sounds like quite the adventure! I am loving both of these outfits! A good black tank top is a must have piece! Your patterned bottoms are gorgeous! You are the bravest ever---I'm sure I'd be moving if I saw a snake! Or never leaving my house! But the outfits are great, and I'm glad you gave the tank another try!! That yellow necklace is fabulous---yellow is my favorite color and I always think it brightens up anything! I absolutely love the colour of your skirt and bag, I love a golden yellow, I think it flatters all skin tones. I also don't think you're overdressed for playgroup, you look lovely. That bag is very cute! love the skirt!! so pretty! Omg! First driving issues (which you know I can relate to! I would have totally freaked out! ), and then A SNAKE?!? NO THANKS! I run screaming from the crickets in our basement, so I am not ready to be a snake wrangler! You had quite a day, Mica! haha yes it was one of those days, glad when it ended! The yellow purse is perfect for Spring!! Beautiful printed skirts! Wearing them with a tank is such a great way to dress them down for more casual looks. I need to remember this when it warms up. Thanks so much for linking up with Fabulous Friday! Yes I'm needing to be tougher on which pieces stay and which go! Thank you all for your kind comments - and sympathies with the snake, eek!